The developer of a pioneering green energy power plant today announced it had sealed a financial package and construction contract to enable the scheme to be delivered. The announcement by Spencer Group, one of the UK’s leading privately-owned multi-disciplinary engineering businesses, means construction of the £200m Energy Works scheme in Hull, Yorkshire, will begin in January 2016, with the 25MW net power output facility due to be operational by January 2018. Hull-based Spencer has steered the Energy Works project since its conception in 2010, making a multi-million pounds investment through Energy Works (Hull) Ltd to take the scheme to its delivery phase. The development will now be funded by three new equity partners in Energy Works (Hull) Ltd –Bioenergy Infrastructure Group (BIG), an independent power producer established to invest in the construction of new biomass and energy from waste (EfW) plants in the UK; Noy Fund, an investment group based in Israel focused on major infrastructure and energy projects; and John Hancock, through its affiliate Hancock Natural Resource Group (HNRG), a long-established timber, agriculture, and renewable energy investment management company. Spencer will remain a shareholder in the business, to ensure ongoing local involvement in the facility’s management and operations. Energy Works will be delivered under an engineer, procure and construct (EPC) contract by global engineering and construction company M+W Group, a market leader in the delivery of state-of-the-art EfW facilities. Spencer will carry out the civil works as well as managing the construction phase and subsequent management of the operations of the completed plant on behalf of the investors. Energy Works will be the largest facility of its type in the UK and the first advanced gasification power plant supported by the Government’s Contracts for Difference (CfD) arrangements, which have been put in place to stimulate investment in green energy developments to achieve targets for carbon reduction. Under the CfD mechanism the combination of environmentally-friendly technologies within Energy Works has been classified by the Department of Energy and Climate Change (DECC) as an “Advanced Conversion Technology”. The CfD allocation ensures a guaranteed price for the renewable energy produced by Energy Works and exported into the National Grid, up to 2033. The project has also been awarded a grant of almost £20m from the European Regional Development Fund, in recognition of its innovative processes, the role it will play in pioneering greener and cleaner technologies and its contribution to regeneration in Hull. 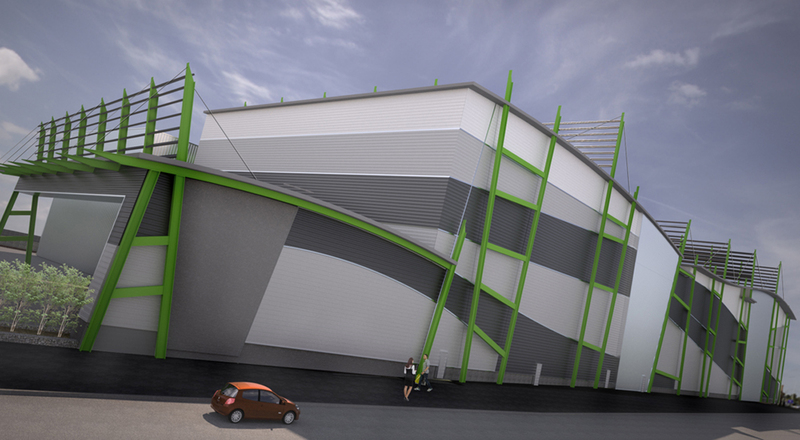 Energy Works will be built on an eight-acre riverside site in Cleveland Street, Hull, and will generate renewable electricity from domestic and commercial refuse-derived fuel, using an innovative energy recovery process called fluidised bed gasification. The plant’s feedstock would otherwise be sent to landfill or transported to more distant UK or European processing facilities for disposal. Energy Works will also reduce dependency on imported fossil fuels. Recent refinement of the scheme has included provision of an enhanced, highly-sophisticated pre-treatment facility to deliver improved flexibility in feedstock handling. Air quality is maintained by careful management of air flows within the process. Energy Works will generate sufficient electricity to power 43,000 homes and stimulate the economy, through the creation of jobsduring the construction phase and around 30 permanent positions once Energy Works is operational. It will also regenerate a long-disused brownfield site. In addition to feeding electricity into the National Grid, Energy Works will be able to provide power to local businesses, thereby enabling nearby companies to benefit from a locally-generated energy source and reduce their carbon footprint. Charlie Spencer OBE, founder and Executive Chairman of Spencer Group and Chairman of Energy Works (Hull) Ltd, said: “We are delighted to have reached financial close and to have agreed a contract for the construction of Energy Works, which will enable us to move into the delivery phase of this pioneering development. “A development of this scale and complexity naturally poses many challenges and all those involved are to be congratulated for their commitment and perseverance in taking the project through to this point. With full planning permission in place and extensive preparatory site works and investigations having already taken place, construction will begin within weeks, as the delivery arrangements are mobilised. © 2019 Energy Works. All Rights Reserved.